The Allegiant World Mastercard® is an airline rewards credit card from Bank of America. With a relatively modest $59 annual fee, it boasts a solid travel rewards program that favors frequent Allegiant Air customers and people who enjoy dining out at restaurants. Cardholders enjoy free, ongoing membership in the myAllegiant loyalty program for frequent Allegiant Air flyers. All Allegiant Air spending, including on non-airfare services (such as hotels and rental cars) sold through the company’s website, earns unlimited 3 myAllegiant points per $1 spent on eligible purchases. All dining spending earns 2 points per $1 spent on eligible purchases, and all other spending earns 1 point per $1 spent on eligible purchases. Allegiant Air is a low-cost airline with about 20 focus cities throughout the U.S. and service to dozens more. (Before booking, check out the complete route map.) It’s also known for its charter services and vacation bundles that combine airfare, hotels, and car rentals at deeply discounted prices. Its wheelhouse is leisure travel between northern cities and sunny vacation towns – so, if you’re planning an extended trip to a warm-weather destination, Allegiant Air and its companion credit card are definitely worthy of your consideration. Here’s what you need to know about Allegiant World Mastercard’s rates, fees, rewards, and benefits. When you spend $1,000 during the first 90 days of opening your account, you get 15,000 bonus myAllegiant points. That’s worth $150 when redeemed on airfare and other forms of travel at Allegiant’s travel portal. All Allegiant purchases made with this card earn unlimited 3 myAllegiant points per $1 spent on eligible purchases. This category includes Allegiant airfare, hotels, rental cars, destination attractions, and vacation packages purchased through the company’s website or phone booking system. All dining purchases made with this card earn unlimited 2 points per $1 spent on eligible purchases. All other purchases earn unlimited 1 point per $1 spent on eligible purchases. You can redeem your accumulated points for any Allegiant product, including airfare, hotels, rental cars, and vacation packages. There’s no minimum redemption amount, and points are generally worth $0.01 apiece at redemption, though Allegiant reserves the right to change this at any time. When Allegiant cardholders combine 1 Allegiant airfare ticket with a Allegiant-purchased hotel stay of at least 4 nights or an Allegiant-purchased rental car of at least 7 days, they get a second Allegiant airfare ticket for free. This essentially functions as a companion airfare award for traveling couples. There’s no limit to the number of times it can be invoked within a calendar year. Allegiant World Mastercard cardholders get priority boarding on all flights, regardless of destination or fare class. There is a 12-month, 0% APR on balance transfers, beginning on the day you open your account. Qualifying transfers must be made within 60 days of account opening. See terms for current regular APR information. 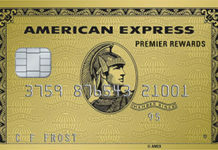 This card comes with optional overdraft protection for Bank of America deposit accountholders. If you elect to participate and subsequently attempt a transaction that would normally result in a negative account balance, Bank of America automatically draws on your Allegiant World Mastercard’s cash advance credit line for a sum equal to or larger than the shortfall. There is a fee of $12 per occurrence, or $12 per day on days when multiple overdrafts occur. Overdraft cash advances begin accruing interest immediately, so it’s in your best interest to pay them off as quickly as possible. There is a $59 annual fee. International transactions cost 3% of the transaction amount, and cash advances and balance transfers cost the greater of $10 or 3%. Late payments cost up to $37, while returned payments cost up to $27. Simple Rewards and Redemption. For a travel rewards credit card, Allegiant World Mastercard has a pretty straightforward rewards program. You earn 3 points per $1 spent with Allegiant Air, 2 per $1 spent at restaurants, and 1 point per $1 spent everywhere else. You can redeem those points for airfare, car rentals, hotels, and destination attractions through Allegiant’s travel portal, with no minimum or maximum redemption threshold. Many competing airline credit cards have complicated programs that require lots of mental energy (and plenty of poring over fine print) to decipher. Buy 1, Get 1 Is Ideal for Extended Vacations. If you’re planning a longer vacation with your significant other or close friend, the buy 1, get 1 free airfare deal is right up your alley. You just have to purchase 1 full-price airfare ticket, plus at least 4 hotel nights or 7 rental car days, with your Allegiant World Mastercard. On longer, more expensive flights, the value of this promotion can easily exceed $400. 12-Month Introductory Balance Transfer Promotion. This card’s 12-month, 0% APR balance transfer promotion is a great deal for frequent travelers carrying high-interest credit card balances from days gone by. Most fellow travel cards don’t offer balance transfer promotions, let alone year-long interest-free honeymoons. No Blackout Dates or Other Redemption Restrictions. Allegiant doesn’t enforce blackout dates or destination restrictions on award travel. At redemption, your points are as good as cash. By contrast, many major airlines do impose blackout dates and destination restrictions that restrict or completely block access to the most popular destinations at the busiest times of year. Overdraft Protection for Bank of America Accountholders. If you’re a current Bank of America accountholder, you can use this card for protection against overdrafts caused by unforeseen cash flow issues or emergency expenditures. Bank of America is one of the few credit card issuers that offer this welcome layer of security. Nice Fringe Benefits. This card has some nice, though not overly generous, fringe benefits. When you purchase Allegiant airfare with your Allegiant World Mastercard, you always get priority boarding, meaning you don’t have to wait on line in the terminal with your fellow passengers. 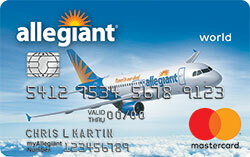 And simply having this card entitles you to a complimentary in-flight beverage on every Allegiant flight. Depending on how often you fly, this along could offset the card’s annual fee. Charges an Annual Fee. Allegiant World Mastercard charges a $59 annual fee. While not excessive by airline credit card standards, it’s still an unwelcome feature, especially for infrequent travelers who struggle to accumulate points quickly enough to offset the recurring charge. Points Have Relatively Low Redemption Value. Allegiant’s myAllegiant points are versatile, but their redemption values are relatively low: just $0.01 apiece in most cases. By contrast, major airlines such as Delta, United Airlines, American Airlines, and British Airways all allow their loyalty miles’ values to float. When you redeem miles earned with those airlines, you generally get better value on long-haul flights and higher fare classes – in some cases, pushing the value of your points higher than $0.03 or $0.04 apiece. Those kinds of returns simply aren’t attainable with Allegiant. Charges a International Transaction Fee. This card comes with a 3% international transaction fee. That’s bad news for cardholders who routinely travel outside the United States – it’s basically a 3% surcharge on international travel. Most competing travel credit cards waive international transaction fees. Has a Penalty APR. This card has a penalty APR – a steep price to pay for a single missed payment due date. Mediocre Sign-up Bonus. Allegiant World Mastercard’s 15,000-point sign-up bonus isn’t especially generous. Worth $150 in most cases, it’s enough to cover the cost of a mid-priced hotel, 2 to 3 days in a mid-sized rental car, or a short-haul Allegiant flight with no checked bags. That’s better than nothing, but it’s far short of top-of-the-line travel card sign-up bonuses – for example, Chase Sapphire Preferred‘s sign-up bonus is worth up to $750 when redeemed for travel. Despite a distinct lack of name recognition, Allegiant Air has a surprisingly comprehensive network that covers most of the continental United States – about 100 origin and destination cities in all, including a slew of under-served airports outside small cities. If you live far from a major air hub, Allegiant Air may well be one of your top choices for cheap direct or 1-stop flights to your favorite vacation destinations. Whether you’re going to Miami, Las Vegas, San Francisco, or anywhere in between, Allegiant has you covered – in many cases, for less than the competition. Allegiant World Mastercard isn’t the most generous airline credit card around, but it’s definitely a strong choice for frequent Allegiant Air travelers who like to make all their travel arrangements – hotel, rental car, airfare, attractions – in one place. The buy 1, get 1 airfare deal is great for traveling spouses or partners, and the 0% APR balance transfer promotion is an unusual and welcome benefit for applicants carrying high-interest balances into the relationship. That said, this card isn’t for frequent travelers who prefer to mix and match airlines, nor those seeking outsize sign-up bonuses. The Allegiant World Mastercard®‘s top benefits include its simple rewards and redemption scheme, the BOGO airfare deal, the introductory balance transfer promotion, the lack of blackout dates and other restrictions, the overdraft protection arrangement for BoA customers, and its fringe benefits for Allegiant travelers. The major drawbacks include the $59 annual fee, the 3% international transaction fee, the relatively low redemption value for accumulated points, the penalty APR, and the mediocre sign-up bonus. All in all, Allegiant World Mastercard is an excellent choice for frequent Allegiant flyers who hate redemption minimums, blackout dates, and other restrictions.